Gimme a few hip hip hoorays. Awww, thanks. I love presents, I love attention (but only on my birthday) and I love birthday cake! One year when I was young (maybe 10 years old) I asked my mum if was going to have a birthday cake. She grumbled a bit and said she'd pick one up after work. It was a honey and ginger swiss roll (the cheap ones from the shopping centre) and I was soooo disappointed, it just didn't feel like a birthday. 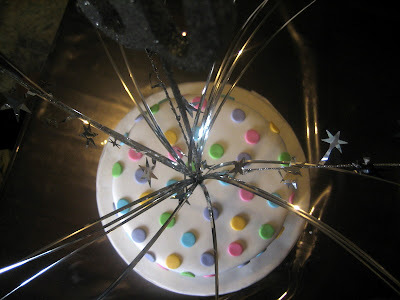 From that day on I told myself that it wasn't going to be a good birthday unless there was good cake! Now i'd call that a good 30th birthday cake, even if I did make it myself - hehe. My daughter and husband made me a mothers day cake (i should post that up sometime soon) but i gave them strick orders to NOT make me a birthday cake (you'll see when I post the pics) because I wanted to make one myself. 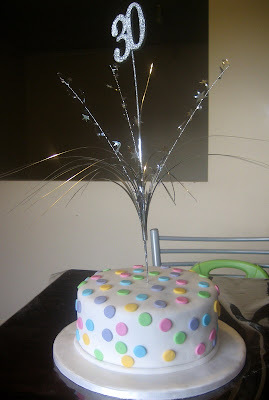 The cake was originally going to have flowers on it but they didn't turn out, then I was going to have ruffles on it but my Dad said 'those carnations look nice' so i scraped that idea, then I remembered my Maisie Fantaisie book Sweet and Simple Party Cakes that hada polka dots cake and voila - here it is. 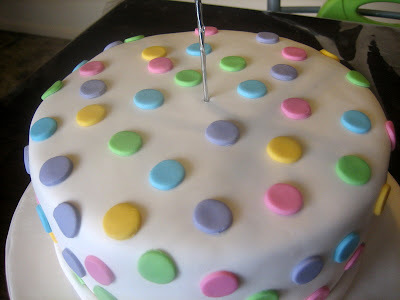 I must say this polka dot cake is fantastic for beginners, not only does it look good but you can hide any imperfections with the dots - yay. 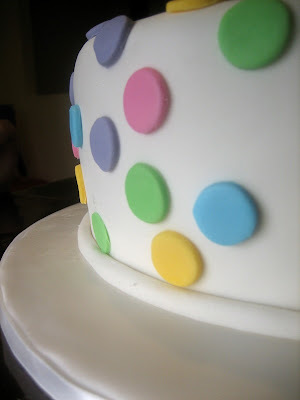 A cool little trick, hiding the bottom with some rolled fondant, it made it look kinda professional. 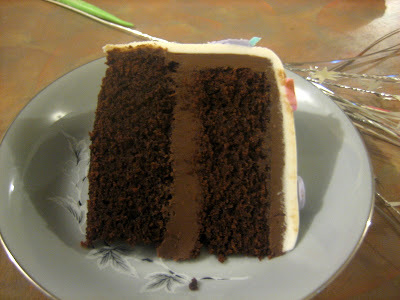 Whooa, I made the chocolate fudge cake in the book and boy was it sweet. I love sweet things but it was a little hard to eat. I'll definitely cut out some of the sugar next time (it has 4 cups!). The original Dotty About You by Maisie Fantaisie. Apparently the 30's are the new 20's (whatever that means!) so it's good to be young again! Happy birthday! Having 30 is great! That cake looks amazing, I bet it tastes good too! I cant believe you are 30!! You look way younger than me!! (I was 30 in January, and I cant even remember if I had a cake....) I like the photo with the feathers on top of the cake... very professional!! 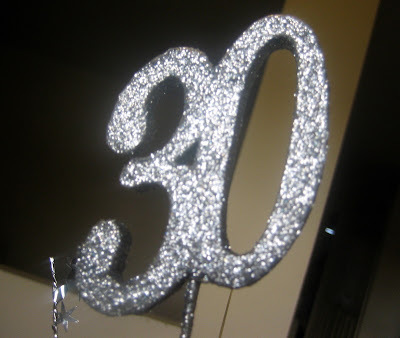 Where did you find your 30 cake topper? Anonymous: I found the topper at Spotlight in the party section. They have just about every age and occasion available. Thank you! Is there a website for Spotlight? I have never heard of them. I live in Michigan. Thank you for the info! And your work is beautiful! Great design of cakes. Nice job. Amazing Design of Cupcakes in different kinds of occasion. Congratulation. 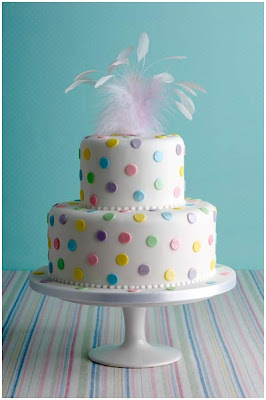 Simple yet elegant cake for people who are celebrating their 30th birthday. Beautiful indeed.